Now that the weather is getting nicer Clevelanders start heading outside to enjoy it. 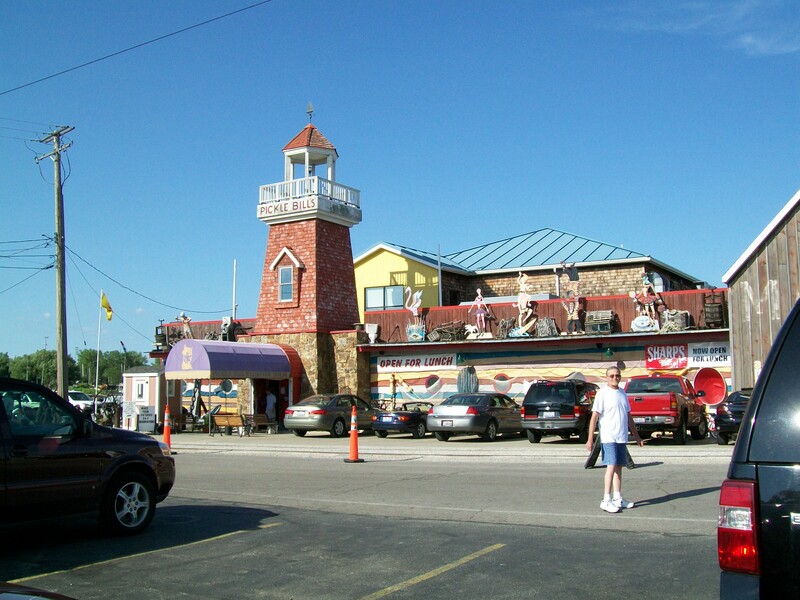 One great place to enjoy the warmer temperatures is Pickle Bill’s in Grand River. It is a bit of a drive from Cleveland, but it is well worth it. If you try to find it using Mapquest or GPS you might not get there. The best way to do it is head to Mentor Headlands Beach. Pickle Bill’s is right off Route 44. There is a big sign. You can’t miss it. The restaurant is aware of the problem, so they offer detailed directions on their website for people coming from the north, south, east and west. They are closed on Mondays, open Tuesday-Friday from 4 to 9 p.m., Saturday from 3 to 9 p.m. and Sunday from 1 to 8 p.m. Be sure to call for Barge and Rooftop bar hours, as they are weather-dependent. 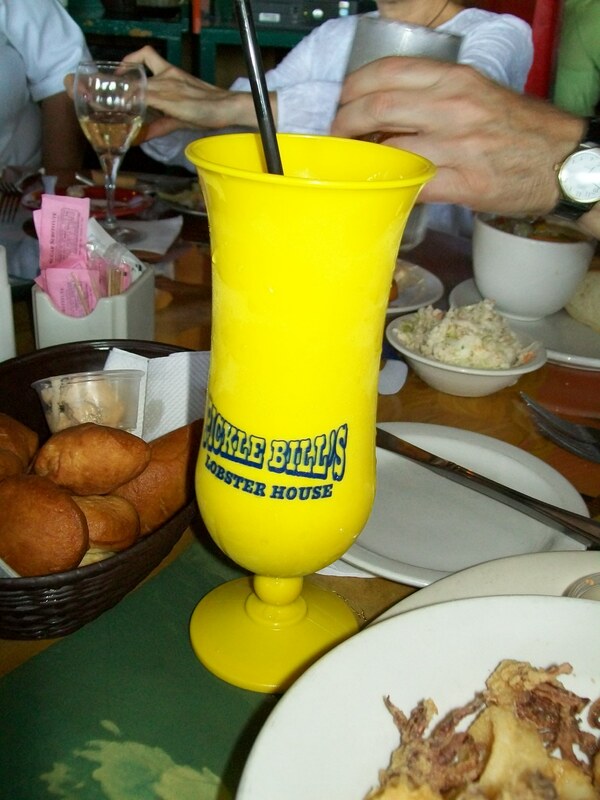 According to the Pickle Bill’s website, the name Pickle Bill’s was conceived back in 1967. Its first location was on Old River Road in the Cleveland Flats. It was in business for 11 years and had a fairly limited menu. In 1982, Pickle Bill’s relocated to River Street in Grand River. There was a fire in 1998 and it was a total loss. The restaurant rebuilt and reopened in January 2000. There is no mention of the Lakewood location (which is now Deagan’s) on the website, but I remember eating there several times in the 1990s. Pickle Bill’s can be enjoyed year round, but there is nothing better than sitting outside on their patio or on the Dock or the Barge, which features the carousel-like round bar, in the middle of the Grand River. There is also a Fireplace Room, Rooftop bar and Cantina bar. This is my go-to place for seafood and frozen adult beverages. I have been eating at Pickle Bill’s since it was in Lakewood. I never made it to the location in the Flats. The decorations are whimsical and reminiscent of a seafood house full of kitschy ocean- and seafaring-inspired decorations. The fun decor somehow makes you relax and enjoy yourself. This place is not fine dining, but the quality is good. It bills itself as “casual waterfront dining.” I have yet to have a bad meal here. All of the entrees are served with choice of mixed greens, Caesar salad or cole slaw, one side dish, and their fried dough and cinnamon honey butter. The choice of sides include mixed vegetables, spicy red beans & rice, French fries, corn on the cob or baked potato. Let’s talk about the rolls for a second. Like Red Lobster’s Cheddar Bay Biscuits, the Pickle Bill’s fried dough and cinnamon honey butter are extremely addictive. 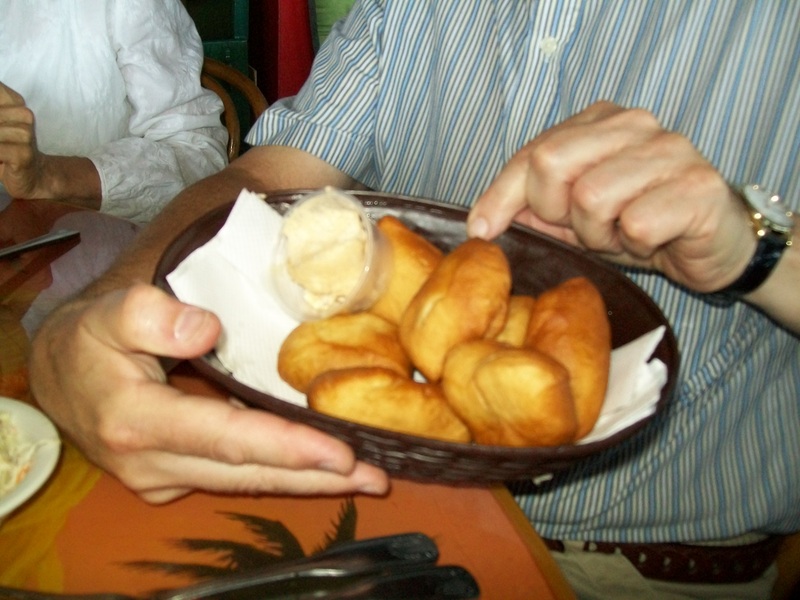 It is easy to fill up on the fried dough. It is that good. Light as air and slathered with their cinnamon honey butter, these things are the bomb. You can see from the photo how much cinnamon is in the butter from the darker color. It’s almost worth the trip just for the fried dough, but luckily they have lobster, crab legs, shrimp, various sampler platters and all kinds of all-you-can-eat specials. Unless you are a bottomless pit or all-you-can-eat pro you might be better off just ordering dinners off the menu. My sister and I ordered the all-you-can-eat snow crab legs (currently $42.95) back when they were still in Lakewood. The waitress felt bad for us because we were full after just one bucket and changed our bill to the 1 lb. dinners (currently $22.95). And we had limited ourselves to one piece of fried dough! The snow crab legs are a lot of work, but worth it once you fish the succulent chunks of crab meat out of the shell. One of my friend’s favorite choices is the Appetizer Dinner. You can choose two appetizers (under $11.95), either a Caesar or mixed green salad and one side dish for $19.95. It is a great value. My go-to meal is the Fine Kettle of Fish, which features a 1 lb. whole Maine lobster (or a 5 oz. lobster tail), snow crab legs, clams, mussels and corn on the cob for $35.95. You can also upgrade to a 1 1/4 lb. lobster for $40.95 or 1 1/2 lb. for $44.95. I have ordered it numerous times, and the seafood always comes out perfectly cooked. Even the corn on the cob is not overcooked! The fish dinners serve huge filets of fish that extend over the sides of the plates. Two of my friends who are vegetarian but eat fish and chips loved their fish dinners here. One ordered it with the chips (aka French fries – pictured), while the other ordered the corn on the cob. Both pieces of fish extended over the sides of the plates. I am fairly certain the fish in the photo on the right is the panko-crusted walleye, but they also offer perch, tilapia, salmon and cod fish dinners. They also serve Whiskey Island Chicken, ribs, prime rib and a (cheese)burger for those of you who are allergic or don’t like seafood but are married or dating a seafood lover. My one friend who ordered the ribs enjoyed them a lot. Be prepared for lots of food and lots of plates. I once ordered the lobster dinner and added on an order of snow crab legs. The lobster, the snow crab legs, the corn and the mashed potatoes were all served on their own separate plate. In fact, the photo of the snow crab legs is from that meal. I have celebrated my birthday here two times. They sang for me (not too obnoxious like in other restaurants) and gave us a small birthday cake! The cake is nothing to write home about, but it’s free and they wrap it up for you to take home. If you actually have room for dessert, everyone in my group who tasted it raved about the key lime pie. Ladies, be sure to visit the ladies’ room and lift the leaf loincloth of the guy in the mural. An angel will get its wings.